Posted on March 5, 2008	by Linda S.
I’ve been busy as a bee working on the crocheted christening set for the new grandchild that is on the way. Baby Angelina will be here in May, so I am considering making a second blanket that is much lighter than the one I have just finished. This set still requires the ribbons, roses and applique that will finish it off and I am off today to visit JoAnn’s and possibly Hobby Lobby to see what there is to offer. The blanket turned out lovely ( a basic (sc,2dc) shell pattern) but is quite heavy for May in Arizona. The pattern I am looking at as a second blanket with this set is at Panda Yarns.biz. They are an Australian yarn company and well worth a bit of time looking around through their site. Their free patterns are listed in the sidebar under Publications. The pattern I am looking at is a circular shawl and is quite lacy without being so open that little feet would be sticking out all the time. 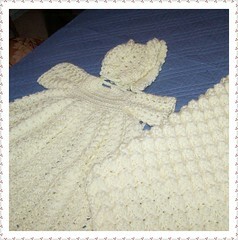 This entry was posted in Crochet, Free Patterns, Handcraft, Handwork. Bookmark the permalink. I’ve heard that Easter Egg dye tablets dye wool well, and it’s just about that time! Do you suppose I’d follow your same steps? I have undyed wool that I purchased about a year ago, lol. I was looking for Pattern Number Z277 from a ball of Baby Wool that advertised a free pattern for a baby jacket and hat. IWOULD LIKE TO HAVE THE FREEZ276 PATTERN,THANK YOU,. I WOULD LIKE TO HAVE THE Z276FREE PATERN THANK YOU. Could not find on your site. please may I have free pattern Z162? iI ưould like to make a poncho for an adult using panda yarn. please send me a free pattern if you have one. many thanks.